Welcome to the latest Self-Sufficient Saturdays feature, where we try out projects that can easily be done in an apartment. Breakfast muffins are a staple at our house for busy weekday breakfasts. I used to buy them at the store until I found out how easy it is to make muffins yourself. There are no special ingredients, and you can rescue overripe, black bananas from getting thrown out. Just one problem: my cheap hand mixer that I’ve had for six years finally gave up. My original recipe required an electric mixer to blend all the ingredients. Creaming butter and sugar just does not work well without one. I’ve tried it, and the results were not great. Through trial and error, I finally found a muffin recipe that works well with hand mixing. Here is the recipe. 1. Preheat the oven to 350°F. Line the muffin tin with paper cups if you are using them; otherwise, grease the muffin tin with cooking oil. 2. Mash the bananas with a fork in a large mixing bowl. 3. With a spatula or large spoon, mix the melted butter with the mashed bananas. 4. Mix in the sugar, egg, and vanilla. 5. Sprinkle the baking soda and salt over the mixture and mix in. Add the flour last and keeping mixing. You can tell it is well mixed when you no longer see any dry powdery lumps. 6. Pour the mixture into the muffin tin. 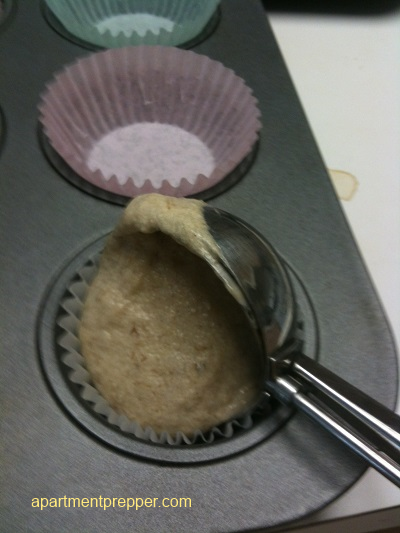 Tip: The easiest way to do it is by using an ice cream scoop to pour the muffin mix into the muffin cups. 7. Bake for 30 to 45 minutes. My oven gets very hot so it only takes about 35 minutes so check often. You can tell the muffins are done when you poke with a fork and the fork comes out clean. I plan to buy a solar oven one of these days, (as soon as the budget allows) and this will be one of the first recipes I plan to make in a solar oven. These muffins will stay fresh in the fridge from one to two weeks. But they may get eaten way before then! Sounds wonderful! A hand rotary mixer should cream, too, with soft butter and sugar. I know it makes great scrambled eggs. Hi Linda, I had one of those years ago, I need to get another one. Thanks for the reminder! my grandmother taught me to cream butter & sugar with a fork. if butter is near room temperature, it’s easy. cut the butter into 1tbsp pats, measure in the sugar and work it with a fork. with practice this is about the same amount of time as loading a mixer, finding the beaters, and cleaning them off for the dishwasher. Hi amy, That is the great tip. I’d never know how to do this, I will have to give it a try. Thanks amy!